Hi. My nephew (5th grade) LOVES mysteries and is starting to read through Agatha Christie's books. 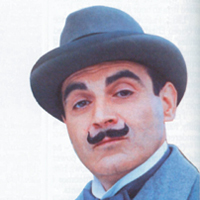 He's an exacting reader and is curious to know what Poirot's saying when he drops into French. Has anyone come across a website with a glossary of these sayings? Join in and write your own page! It's easy to do. How? Simply click here to return to Murder Mystery Q & A.